Donald Trump performed best on Tuesday in places where the economy is in worse shape, and especially in places where jobs are most at risk in the future. 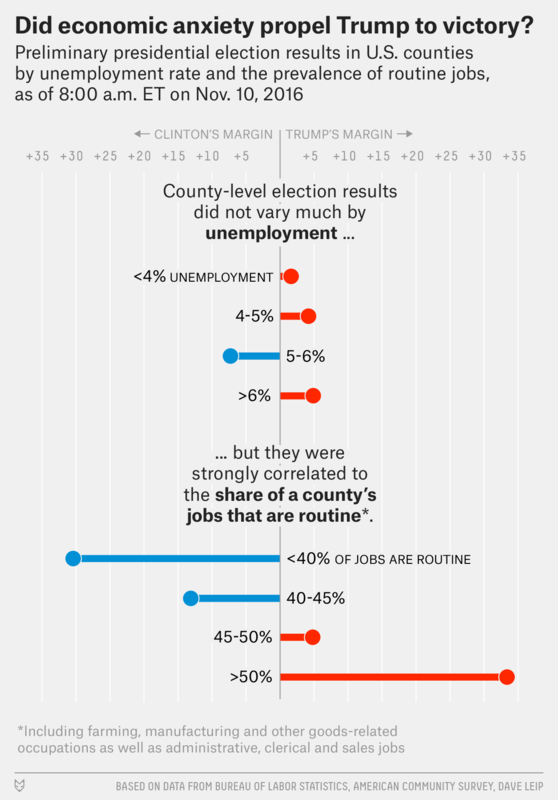 Trump, who in his campaign pledged to be a voice for “forgotten Americans,” beat Hillary Clinton in counties with slower job growth and lower wages. And he far outperformed her in counties where more jobs are threatened by automation or offshoring, a sign that he found support not just among workers who are struggling now but among those concerned for their economic future. In the months leading up to Tuesday’s vote, experts debated how much Trump’s support was driven by economic anxiety or by racism, xenophobia or other factors. These reasons are not mutually exclusive, of course, and the debate will continue long into Trump’s presidency. But county-level voting results suggest that economic issues underpinned at least some of Trump’s support. Comparing Trump’s vote share and other variables can only take us so far, however. For the most part, Trump did better in places that typically vote Republican — there is a strong correlation between how Trump performed in 2016 and how Mitt Romney performed four years earlier.4 So if routine jobs tend to be concentrated in Republican-leaning areas — as I found a few months ago — that doesn’t necessarily reveal much about whether economic anxiety fueled Trump’s support, in particular. Demographic factors such as age, race and immigrant share also correlate with the swing toward Trump, although among these only age correlates as strongly as routine job share. However, it’s nearly impossible to disentangle economic factors from other explanations for Trump’s victory because demographic characteristics and economic conditions are themselves related: Counties with older populations tend to have higher unemployment, slower job growth and a higher routine-job share. And some measures are clearly intertwined with both economic and social issues. For instance, counties where more adults are college educated have dramatically higher earnings and a lower routine-job share, but also lots of other favorable social, health and economic outcomes. Still, it is clear that the places that voted for Trump are under greater economic stress, and the places that swung most toward Trump are those where jobs are most under threat. Importantly, Trump’s appeal was strongest in places where people are most concerned about what the future will mean for their jobs, even if those aren’t the places where economic conditions are worst today. All statistical relationships described in this post are based on county data and weighted by each county’s total vote count in 2016. The correlation between Trump support and 2012-15 job growth was -0.10. The correlation with average earnings was -0.38. There was also a positive correlation of 0.23 between Trump support and the change in unemployment rate from 2012 to 2015 — places that saw their unemployment rates rise, or fall by less, were more likely to support Trump. All are statistically significant at the 1 percent level. Routine jobs are often defined as those that involve tasks that can be accomplished by following explicit rules. A standard definition of routine jobs includes manufacturing and other goods-related occupations, as well as administrative, clerical and sales occupations; nonroutine jobs include professional, managerial and service occupations. For this post, we included farming-related occupations in routine jobs since the BLS projects employment declines in those occupations over the next decade. The correlation between Trump support and the share of jobs that are routine by this definition was 0.65. The correlation across counties between Trump’s margin vs. Clinton in 2016 and Romney’s margin vs President Obama in 2012 is 0.96. Correlations with the difference between Trump’s margin and Romney’s margin: 0.55 for routine job share; 0.23 for unemployment rate; -0.39 for job growth, and -0.40 for earnings. These correlations are similar if the swing is measured relative to the average vote over 2000, 2004, 2008 and 2012 rather than only 2012.